George Maciunas began to develop the modular prototype used in Fluxhouse in 1955 and continued to do so while working at Olin Mathieson’s division of Aluminum Product Development and Design. He filed a patent for the invention of a structural framework for prefabricated buildings using aluminum beams and columns on January 27, 1958. 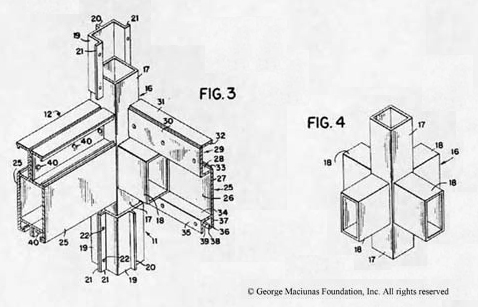 Maciunas was awarded a patent for a modular building system on February 7, 1961. The design for Fluxhouse was completed and copyrighted on December 27, 1965. 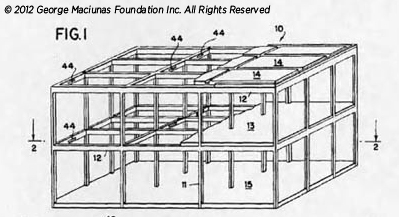 Organized on a three-by-three matrix of rectangular modules mounted on small pilotis, the 1900-square-foot Fluxhouse unit is based on nine mass-produced structural components, sliding nonstructural interior walls, and a service cubicle containing plumbing, heating, and kitchen appliances. 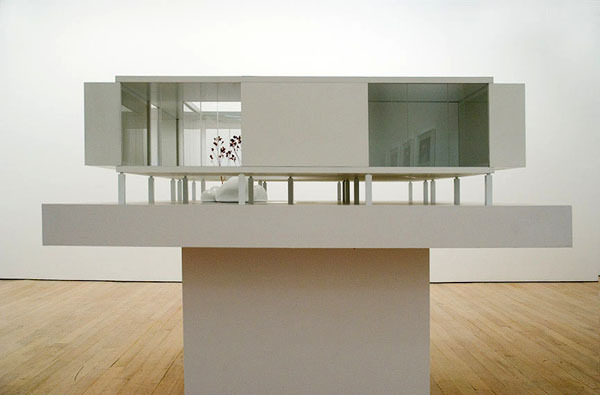 Within this single-story modernist box of transparent and translucent exterior walls, Maciunas designated spaces for three bedrooms, kitchen and bathrooms, dining and living areas, structural cabinets, an entry hall, and an off-center internal courtyard. However, the design was intended to give developers and occupants considerable flexibility in customizing the space to commercial, working, or living functions. 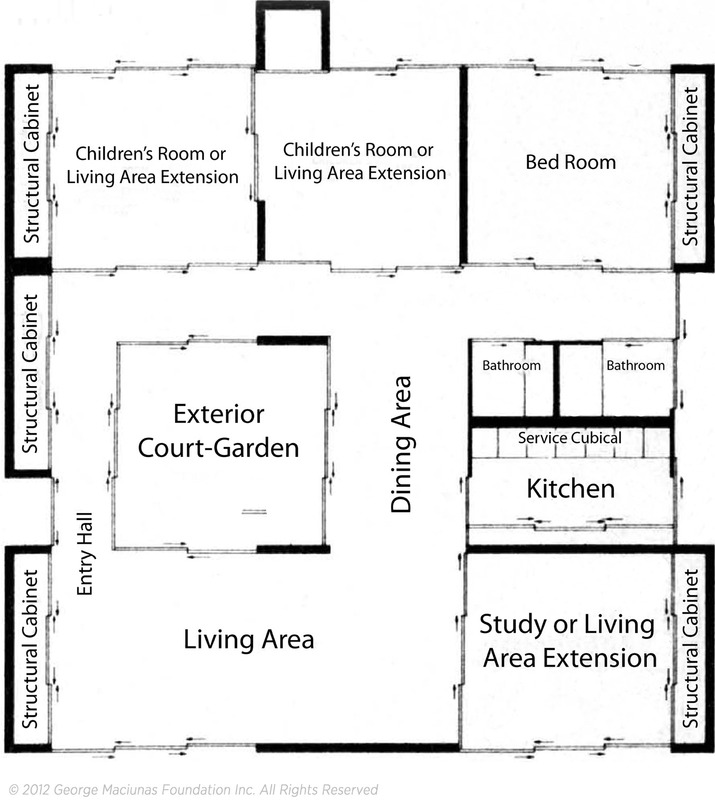 The building instructions requires no heavy machinery or specialized construction skills. Maciunas developed the prefabricated modular unit known as Fluxhouse as an improved design to Soviet Block Housing. Fluxhouse was conceived in consideration to efficiency of materials, transportation, and labor to produce a cost and time effective mass produced housing system. Resistant to natural disasters such as fire, floods, earthquakes, and hurricanes, the Fluxhouse design can be be customized to suit residential, institutional, industrial, or agricultural functions. With the multiplication or subtraction of modular units, this eco-friendly and sustainable design can be adapted to construct a single family home, a mid-rise building, or a neighborhood community. 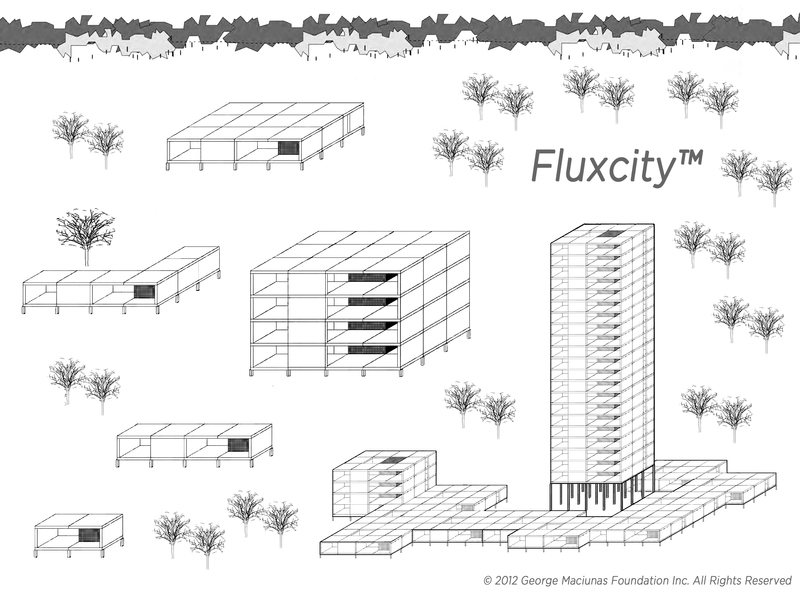 As an efficient modular system intended for factory production, the Fluxhouse design can be affordably expanded into plans for a ‘Fluxcity’ in larger urban projects. In the current real estate market, Fluxhouse holds its greatest potential as a flexible design solution used to resolve the social housing problems which face the United States and the world today. Lithuanian-born American artist George Maciunas (1931-1978) is best known as the founder and central coordinator of Fluxus from 1962 until his untimely death in 1978. Fluxus was a global collective of artists, musicians, and designers bound by their intermedia experimentalism and political engagement in the sixties. Described as “an active philosophy of experience that sometimes only takes the form of art”, Fluxus thoughts and practices have played a pioneering role in frameworks such as multimedia, telecommunications, hypertext, industrial design, urban planning, architecture, publishing, philosophy, and management theory. John Cage, Yoko Ono, John Lennon, Nam June Paik, Joseph Beuys, and George Brecht are among the members who shared Maciunas’ vision. Truly a ‘learning machine’, Maciunas studied architecture, art history, graphic design, and musicology at the Cooper Union School of Art, Carnegie Institute of Technology Pittsburgh, and New York University over the course of eleven years. As an architect and designer, Maciunas’ professional employments included Skidmore, Owings, and Merrill, Air Force Exchanges (Europe), Olin Mathieson, and Knoll Associates. In 1992, The New York Times coined Maciunas’ title as the “Father of SoHo” due to his efforts in the gentrification of SoHo in the sixties in which Maciunas transformed loft buildings into artists’ cooperatives known as the Fluxhouse Cooperatives. Also part of his works as a social planner, Maciunas’ “Flux-boxes”, atlases, diagrams, and historical charts engaged functionality and chronology in learning processes and reflect his conviction to improving education. Consonant with his pragmatic sensibility, Maciunas’ oeuvre of work emphasized flexible and affordable systems for all and his diversity of achievements is testament to his innovative approach. Maciunas’ work has been exhibited in many of the major museums around the world with archives held in The Whitney Museum of American Art, The Walker Art Center in Minneapolis, The Getty Research Institute, and Staatsgalerie Stuttgart. Recently acquired from the Gilbert and Lila Silverman Fluxus Collection, The Museum of Modern Art currently holds the largest collection of Maciunas and Fluxus works of 10,000 items. As part of a touring exhibition organized by Dartmouth College, Maciunas’ work was most recently featured in “Fluxus and the Essential Questions of Life” at New York University’s Grey Gallery in fall 2011 and University of Michigan’s Museum of Art in spring 2012.